The CrossFit Games are the ultimate test of fitness. It's a grueling three-day competition in which the world's fittest athletes compete in a variety of workouts. What are the workouts? Each year they change, and the details of them are not announced until a couple days before the event. This means that all year long, the athletes are training for a competition whose format is almost completely a mystery. 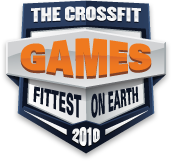 The 2011 Reebok CrossFit Games are coming! The 2010 Games will have five main competitions: Men's Individual, Women's Individual, Affiliate Cup Teams, Men's Masters and Women's Masters (over 50). The winners of the individual competitions will each receive $25,000 cash, sponsored by PROGENEX. There will also be many cash and material prizes for the other winners and top performers. The 2010 Games are limited to 50 men and 50 women, all of whom need to qualify to enter. The top five men and women from the 2009 Games are automatically qualified. All past champions are automatically qualified if they wish to compete. The other 43-45 competitors have to qualify in their Regional Qualifier. There are 13 Regionals around the world, and each Regional will send the top 1 - 7 athletes (men and women) to the Games, depending on the size of the Regional. This year, for the first time, there are Sectional Qualifiers feeding most of the Regionals. In other words, most of the Regionals are open only to the top competitors from their respective Sectionals. From early February to late March, 2010, there will be approximately 30 Sectionals. Most Sectionals will send the top 10 - 20 men and women to their Regionals. Approximately 74 men and 72 women began the first event. All had qualified to enter by one of several means: winning any prior year's Games, being one of the top five finishers from 2008, or by placing high enough in one of the 19 qualifying events in the spring of 2009. Scoring was based on relative finish, so the fewer points the better. The bottom ten athletes (those with the most points) were eliminated from the competition after both the second and fourth events. Only the top 16 men and women (each) continued on to Sunday's events. The team Affiliate Cup was held on Friday, July 10th and Sunday July 12th. It was exclusively team workouts, and open to all teams who registered in time (no qualifying required). In the end, 96 teams competed. Each event required two men and two women to compete, but they could select those four from up to six athletes on the team. Mikko Salo from Finland won the men's competition, while Tanya Wagner from CrossFit Apex in Souderton, Pennsylvania took the women's crown. Northwest CrossFit won the Affiliate Cup. For the 2009 CrossFit Games website, which documented the event thoroughly, click here. Every second counted. Overall winner was the athlete with the lowest combined time for all four workouts. Jason Khalipa won the men's competition and Caity Matter won the women's. CrossFit Oakland won the Affiliate Cup. To see the final results for 2008, click here. For the 2008 CrossFit Games website, which documented the event thoroughly, click here. The scoring was based on points per finishing order and the winner had the highest total points. James Fitzgerald won the men's competition and Jolie Gentry won the women's. CrossFit Santa Cruz won the Affiliate Cup. For a review of the 2007 Games, read Dave Castro's CrossFit Journal article Reading Between the Lines.